The use of water is closely tied to the generation of power. Some of the relationships are obvious, such as the use of water in the creation of thermal energy or in hydroelectric power. Other relationships might be more subtle, such as the use of water for fracking natural gas, or to grow crops that are subsequently utilized as biofuels. Such energy sources pose a range of benefits as well as challenges as we strive to develop a sustainable power grid for the future. Power Plant Cooling: According to the Union of Concerned Scientists, about 90 percent of electricity generated in the United States comes from thermoelectric power plants, including coal, nuclear, natural gas, and oil. Such facilities require water for cooling. Thermal plants boil water to create steam, which, in turn, drives generators to create electricity. Thermal power plants are typically designed to use water on once-through or wet-recirculating systems. While once-through systems have been popular (and still account for 43 percent of power plants) due to their simplicity, the fact that they discharge heated water back into waterways poses environmental risks. Few new power plants are designed with once-through cooling. Hydroelectric Generation: Hydroelectric generation refers to the creation of electricity through the use of moving water to turn turbines. This form of energy is renewable. There are negative impacts, however, in terms of creating water storage behind dams, which can destroy local habitat and even require the relocation of communities. There can also be negative greenhouse gas outcomes related to dam construction, as well as related to flooding and the subsequent release of carbon dioxide and methane gas from decaying organic matter. The location of hydroelectric dams in arid facilities with less organic matter is less problematic in this regard. Water Used in Fuel Extraction: Water usage is a key component of extraction processes for coal, oil, natural gas, and uranium. Before some coal can be burnt, it must be washed with water to remove sulfur and other contaminants. Coal mining, including water needed to cool drilling machinery as well as for coal washing, consumes 70 to 260 million gallons per day. Water is also a key component of natural gas extraction from shale gas deposits and the controversial fracking process. Shale gas is becoming an increasingly important source of natural gas in the U.S., growing from about one-third of supply in 2012 to almost one-half by 2040. Hydraulic fracturing, or hydrofracking, involves sending a mixture of water and chemicals through a drill hole at high pressure to release natural gas. The process requires large amounts of water that can strain local supplies. The use of chemicals in the fracking process has also raised concerns about resulting water quality. Fuel Refining, Processing, and Transportation: Resources such as uranium, oil, and natural gas all must be refined before becoming usable as fuels. These processes require substantial amounts of water. After gas extraction, for example, more than 400 million additional gallons of water per day are used in natural gas refining and pipeline operations. Water transportation is also employed to transport coal slurries, finely ground coal combined with water, as well as to test pipeline systems for potential leaks. There are other uses of water in energy production. Most notable of such applications is the use of water for biofuel production. Water consumption in biofuel production can be very high. According to one estimate, 1,500 gallons of water is required to create one gallon of corn-derived ethanol. Most of the water is needed during the agricultural stage. The U.S. agricultural sector already consumes about 25 percent to 50 percent of domestic fresh water supply. Even without dedicated agriculture to support biofuel production, water shortages are already a factor in many growing areas. 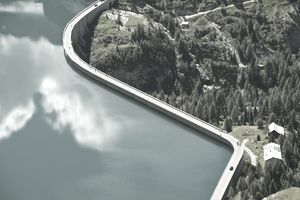 Water could potentially help fill future energy needs through other technologies such as modular hydropower dams, or powering the tens of thousands of dams in the U.S. that currently do not produce power. Other approaches that continue to be explored for the capture of water energy include ocean waves and tides. One recent idea being explored is the potential for evaporating water to create energy. While speculative in nature, the proposal suggests that structures floating on a water surface, especially in an arid area, could capture upward moving water vapor to create power. Water usage is crucial for most current power generation in the U.S. We must make wise choices about how we choose to generate energy as we move forward to ensure water conservation for the future.